For my up-cycle project, I decided to create a drawer out of cardboard. My inspiration came from necessity. I simply was in need for a drawer and this project helped me make one with minimum cost. It was also because I had all the materials needed to create the product. Moreover, I wanted the aesthetics of the drawer to resemble a real furniture. Thus, I have used a wallpaper that has a wood texture to cover the outside appearance of the drawer. 1)Available Materials: due to the requirement of the assignment, my first concern was what materials do I have in my disposal that can be used. Since I have amazon prime, I end up with a lot of shipping boxes. 2) Brainstorming: my biggest concern in this step was to come up with as many ideas as possible. However, the option to build something out of card boxed are endless. Thus, i have decided to do something that would be useful. 3) Objective of product: after coming up with multiple ideas, I have decided to do a drawer because it was something I wanted to buy for my apartment and doing this project will save me money. So two birds with one stone. 4) CAD: I usually would sketch before modeling in CAD, but since the concept was simple, I have skipped it and started with CADing. 5) Drawings: Having a fully dimensioned drawing of each part. 6) Tools: I have yet to reach this step, which states what tools do I need to build my product. 7) Manufacturing: last step is to build the product. After getting all the materials and tools needed for the project, I started cutting and assembling the whole product following the drawing from the CAD I created. I used a big cardboard that was used to ship a computer case with 20x21x12 inches dimension. The two drawers were shipping boxes from amazon. As shown in the previous image, I had to use the foam that came with the box to hold the drawers in place. One of the toughest challenges I faced working in this project is to only use materials that are basically waste. It was tough because as I started working on it, I wanted to make it better, stronger and more aesthetically pleasing. There were many options to achieve that, however it required buying materials, which defies the goal of this project. 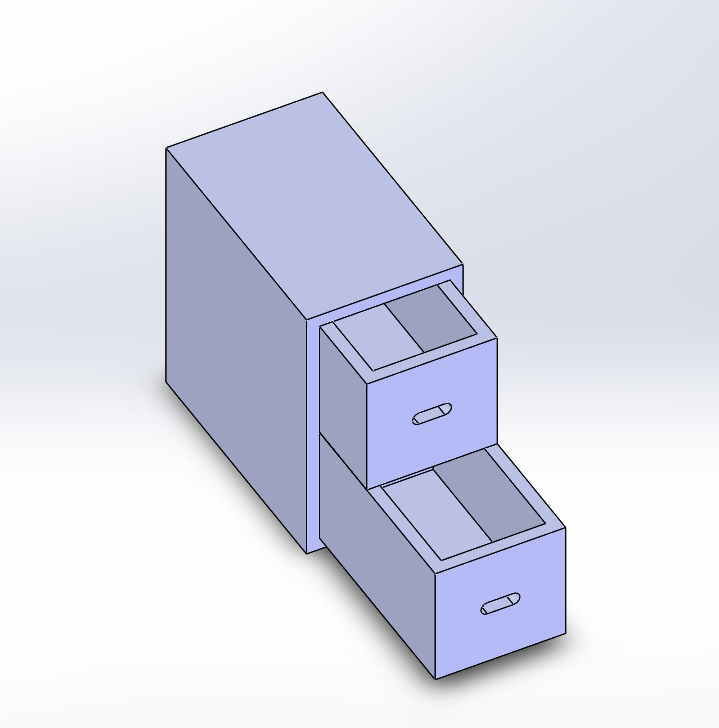 Some improvements that could be done on this design would be to use smalls wheels on each drawer to make its movement much smoother. The product could also be made from compressed wood, which is easy to find as a waste in the ITLL, yet provide a stronger product. Well done! I like that this project almost has an equal balance of being functional and aesthetic. I really like the wallpaper you found. It adds a great aesthetic that is a lot more pleasing to the eye than just cardboard! I’m sorry I didn’t get to see the final product in person. It looks very functional, but I’d like to know more about the aesthetic. Is the aesthetic what you wanted? There are many ways to accomplish an aesthetic without buying anything; for example you could laser cut a pattern into the wall paper and add layers. I really like the drawer and you did a great job with the cardboard. I think if you could of connected the power outlet with an actual power cord it would have been a little more functional. Other than that great job! Hello Aziz, you did a great job with your project. I think it’s really cool that you were able to design something for your home that you needed. You very easily could have bought a shelf off Amazon, but instead you were able to make your own inexpensively and include design aspects that you wanted in the shelf. Great job! Nice work! I enjoy how you based your project around functionality, designing something that you would actually find use out of. Adding the wallpaper was a good idea for a quick aesthetic, and I think it works well as a prototype. Aziz, what a useful way to use cardboard. A drawer is one of the most common things people use next to their bed. We all order a lot of stuff online and we end up gathering a lot of boxes. The way you executed it with the foam and had the little pins for hangers. It would be cool to have larger ones. Nice project and presentation! I like how you created something so practical yet simple. The whole project looks very well put together and the addition of the wooden patterned tape was really the cherry on top. Also, I am excited to hear if you end up adding the improvements you mentioned in your slides. That’s a really cool drawer and using the wallpaper added a lot to the aesthetic. Also, adding a paper clip for your phone charger is smart and useful. My only recommendation is to avoid using foam since it might become messy. Good job! This is a really awesome project. I enjoyed how you were able to create a useful final product using basic materials and engineering principals. Have you thought of adding any more modifications to increase the number of uses such as your hanging pins or cord holder? You mentioned that you intend to use it next to your bed. That is great that it will actually be using it. I wonder how durable that car board construction will end up being. For a drawer made out of card-box, yours looked really well thought out Aziz. I loved the paper clip you added to hold your phone charger as nowadays people just buy some sort of cable holder/manager, so making one of your own was really cool. I wonder if you could add some braces in there to make it stronger. This is awesome! I love the charging cable idea. You have made somehting that you can actually use for a long time! I hope it treats you well. I like that you went in depth with how you would improve this project. The drawers seem a little tipped and the styrofoam messy, so maybe you could try switching the styrofoam out with different cardboard, or wood. I love the pins on the side of the box for reminders, and the clip for charging your phone. This is definitely a useful project! I like how you used this project to create something you need at home. The materials you used were pretty interesting! I would have never thought to use cardboard and wallpaper to make a drawer. Your presentation walked us completely through your design process which was good! What are you going to put in there? Good job! I like your final product! I like that the wall paper you used looks like wood. I think that the wallpaper could have attached been a little cleaner and that would make the final appearance look more professional. The drawers are still cool and useful though! Also I think that the aesthetic could be defined a little clearer.